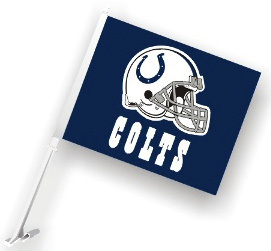 Officially licensed property of the Indianapolis Colts NFL sign, made of durable styrene with die cut hanging hole. These signs work great for indoor or outside use, are nearly indestructible in normal use, and can be washed with soap and water. Made in USA. 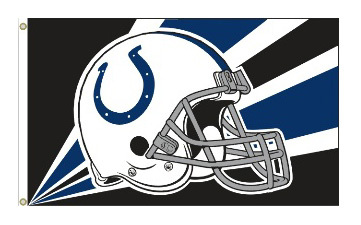 Measures 7.25" x 12"
Indianapolis Colts - NFL Helmet Diecut Ultra Decal, by WinCraft. 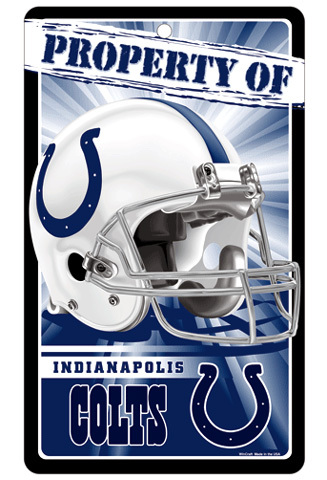 Officially licensed Indianapolis Colts NFL 5.75" x 4.5" color diecut ultra decal. This decal is cut to the outside dimensions of the Dallas Cowboys helmet. These versatile clings can be used indoors or outdoors and will not leave a residue when removed. Made in USA. 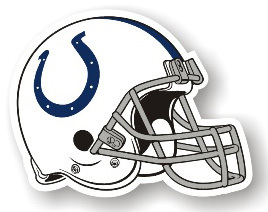 Indianapolis Colts 12" NFL Helmet Vinyl Magnet. 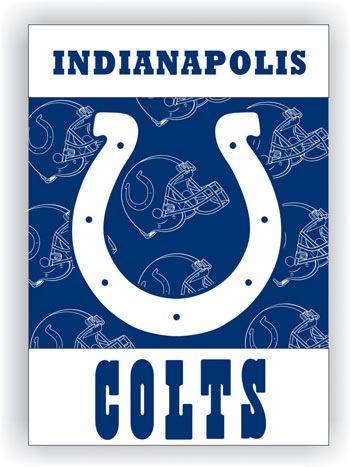 Officially licensed Indianapolis Colts NFL 12" x 10" heavy guage vinyl magnet, great for indoor or outdoor use. Colors stay bright and it's flexible, so it looks great on automobiles. Made in the USA. Officially licensed NFL 6" x 12" license plate made of durable plastic. The plate is a great souvenir decorator piece. Made in USA. Indianapolis Colts / Plastic NFL License Plate Frame, by WinCraft. 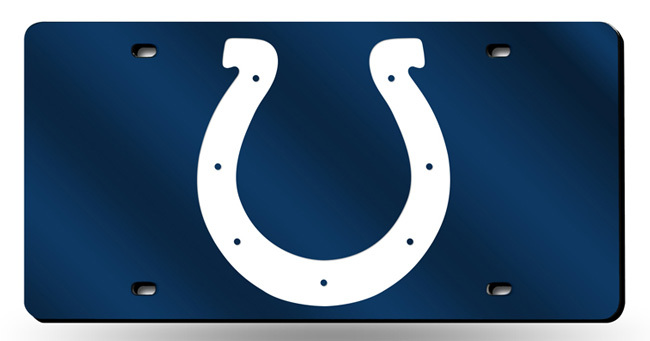 Officially licensed Indianapolis Colts NFL plastic license plate frame, usable as a fan decoration on the outside of a standard car license plate. The frame is molded in durable plastic and is designed around the California standards for tab and sticker clearance. Made in USA. 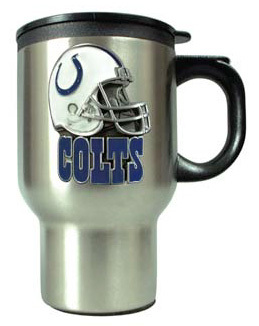 This stainless steel Indianapolis Colts NFL travel mug has a non skid rubber bottom and will fit all auto cup holders. Easy to grip handle and comes with a snap on top. The inside is completely lined to help keep beverages hot. The emblem is made of solid Pewter, it will not rust, corrode or deteriorate with age. Indianapolis Colts / Inaugural Game at Lucas Oil Field Framed and Matted Panoramic Photograph. This officially licensed NFL panorama photo is of the Indianapolis Colts (Inaugural Game) at Lucas Oil Field in Indianapolis, Indiana, on September 7, 2008. The Indianapolis Colts played the Chicago Bears. The deluxe panorama features black double matting and your choice of black or cherry frame, with a 1" x 4" engraved brass nameplate. Actual size is 40" x 14"